BetOnline is part of the up-and-coming Chico Poker Network, or CPN. Chico has grown from relative obscurity before Black Friday into the third-largest US- and AU-friendly online poker network. BetOnline and its sister skin, SportsBetting.ag, are the only two members of the Chico Poker Network that accept USA online poker players. If you are not a USA-based poker player but are interested in the Chico Poker Network, please see our review of TigerGaming, a Chico skin that does not service USA-based poker players and that guarantees 24-hour payouts or they double your withdrawal amount! "Yeah, but is BetOnline legit? I have heard some bad things about them in the past." Yes, we know; we heard the same things in the past. Professional Rakeback refused to work with BetOnline or the Chico Poker Network for many years because of their bad reputation for slow payouts. However, new ownership and management took over in early 2013. The new owners infused new capital into the business and quickly began paying past debts to players, settling player disputes, and cleaning up the mess that the prior owners had left behind. Still, we sat on the sidelines for over a year patiently watching. In the spring of 2014, after over a year of improving reports, we signed a deal with BetOnline to privately test them with a few select clients. After six months of private testing, we were happy to report that all of our players were paid in a timely manner, and any and all minor disputes were handled in a satisfactory way. Furthermore, we have had no issues at all since then. We are happy to see such a positive turn of events and welcome the addition of a new poker site for our faithful clients. The first deposit bonus is a 100% poker bonus - up to a maximum of $1,000 USD. In order to activate the bonus after you've signed up by clicking our banner below, you will need to email poker[at]betonline.ag – from the email address registered on your new account. Make sure to input BetOnline Poker deposit bonus in the subject line. Players have 30 days to clear their poker deposit bonuses. You will also gain access to a $10,000 new depositor's freeroll upon your first deposit. The BetOnline poker deposit bonus was once a complex nightmare. We had to construct elaborate charts in order to show how quickly the bonus cleared over the five different stages it took to finally recover the full value of said bonus. That is no more! The poker deposit bonus codes listed above for BetOnline and sister site SportsBettingAG are very simple now. Players clearing a bonus will release $10 of bonus money for every 5,000 comp points they earn. Players earn 1 comp point per penny of rake or fees paid in cash games, tournaments, or sit and go games. However, in tourneys and SNGs, comps are released in 100-unit increments (rounded down), so the minimum fee to earn any points is $1. As such, the deposit bonus clears at a 20% effective rakeback rate, more or less in line with the industry average. All first deposits are matched 100% so long as they are above the minimum bonus amount of $50 and below the maximum bonus of $1,000. 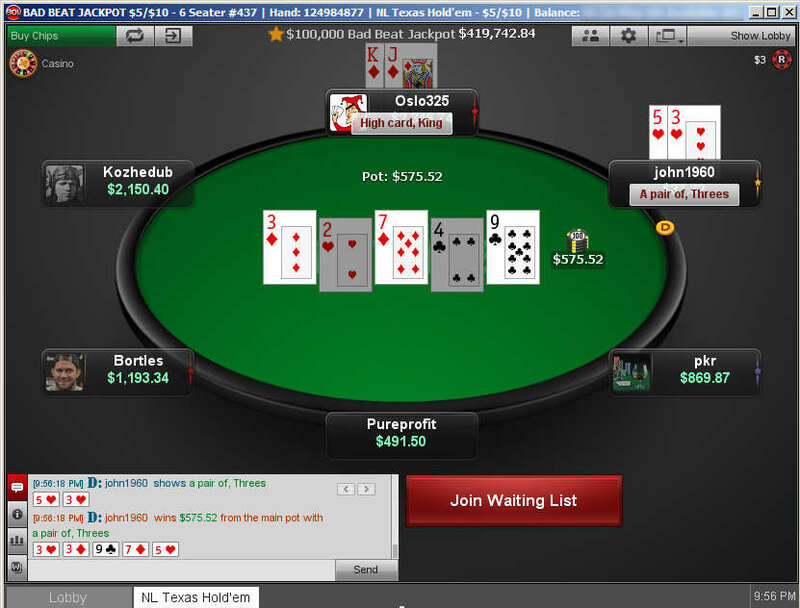 BetOnline hosts quite a few different types of poker games. Cash games that run regularly start at micro stakes no limit Hold'em and go all the way up to $2,000 buy in 6max tables. Pot Limit Omaha (high only and Hi-Lo) runs regularly from microstakes up through $1,000 buy in games, but there's only 6-max without any full-ring being present in four-card games. You are limited to a max of eight cash game tables open at a time. High volume cash game players will be happy to know that the site runs daily cash game challenges that are worth $1,100 per day. There is regular action at single table tournaments thanks in great part to the $5,275 weekly sit and go race, which keeps many forms of SNGs packed. The multi-table tournament action isn't as robust as the cash game or SNG selection; however, what the site lacks in terms of large guarantees, it makes up for in the fact that the tournaments are ridiculously soft compared to other USA sites and often provide extra value in the form of overlays. In late 2017/early 2018, the Chico Poker Network debuted two types of games that allowed it to catch up to the offerings at other competing sites. Windfall Poker is a lottery-style sit n' go format that sees three players contend for a randomly chosen prize pool that can reach as high as 2,000 times the amount paid to enter. Boost is a fast-fold variant that allows players to fold their hands at any time to move instantly to new tables and begin new hands. BetOnline, Sportsbetting.ag, and the Chico Network offer a variety of other gaming products. We here at Professional Rakeback concern ourselves only with the poker offerings (which are quite soft and fishy by the way), but we would like you to know that they also offer sports betting, online casino, horse racing, and other various gaming offerings that our players may wish to participate in. The payout methods listed in this article apply to not only the poker room, but also to the sportsbook, casino, racebook, etc. To see BetOnline account creation instructions in visual form, check out our video above. Or read below for text instructions. STEP 3: : Click the BetOnline logo below, or click the text link provided below the logo. STEP 9: Log into the poker software with your Username and Password. Upon logging in the first time you will create your poker table alias (table name). OPTIONS & OTHER NOTES: There is only one native heads up display that works on BetOnline. That HUD is Holdem Indicator. It also happens to work with virtually every single US-friendly site as well as most non-US sites as well. Among the game formats it supports is Boost Poker, the Chico Poker Network's take on fast-fold cash games. We have a detailed review of Holdem Indicator that you can read about on our updated poker software review page. If you want to skip right ahead to the good stuff, you can purchase Holdem Indicator at a 10% discount which is exclusively offered by Professional Rakeback for our loyal customers. We are sad to announce that the Chico Poker Network does not allow its operators to offer direct cash rakeback, but Professional Rakeback can buy you a new laptop! There is also a VIP program, rake race, and other lucrative rewards to be had. We will show you how to maximize your earnings under these conditions. Your best bet for maximizing your effective rakeback rates is to be sure that you fully maximize the initial deposit bonus of up to $1,000. This bonus is released in $10 chunks each time a player earns 5,000 comp points. Comp points are earned at a rate of 1 point per cent of rake paid. Thus, this bonus clears at a respectable 20% effective rakeback rate. After that, keep your eyes open for poker reload bonuses that are periodically offered by BOL. Taking advantage of these reload bonuses can keep you steadily earning bonus dollars, and thus you effectively have rakeback. Next up is Comp Points. CPs are the internal currency of Chico Network. If you've ever played on other online poker sites, these are more or less "VIP Points" used in the internal VIP structure. CPs help you keep tabs on your deposit bonus earnings. They also can be used to directly buy you into a few worthwhile things. For example, "step sit-n-go" tournaments with progressively larger ticket rewards until you reach the top tier and compete for BIG money. CPs can also be used to buy into the weekly Sunday Major where there's at least $75,000 up for grabs although this prize amount goes up to $100,000 on the final Sunday of every calendar month. All in all, Comp Points are valued at 5% of rake generated, and thus add an additional 5% effective rakeback to the mix. The most effective way to increase your rakeback is to spend the comp points that you earn in the most efficient manner possible. This is almost always achieved by playing in the weekly Sunday Major. You can further increase your return by playing in this tournament on the last Sunday of every month. The reason being that the buy-in amount increases, as well as the prize pool which increases to $100,000. Not only do you get more efficient use of your comp points on the last Sunday of the month, but you also compete in a bigger tournament – a tournament that often overlays for 5-15%, thus increasing your effective rakeback ROI. For you cash game players, there is are daily raked hands challenges, split up by stake level, that award a total of $7,700 per week! Boost and Bad Beat Jackpot tables are excluded. There's a separate leaderboard for $0.05/$0.10, $0.10/$0.25, $0.25/$0.50, $0.50/$1, $1/$2, and $2/$5+. The top three players in each division get paid, and you can sometimes snag a piece of the cash by playing fewer than 1,000 raked hands in a day. FYI, the rake charged at the tables is pretty fair and in line with industry standards. Learn more about BetOnline rake. For sit and go players, there is rakeback in the form of the weekly $5,275 USD Single Table Tournament Challenge. High-volume SNG players rejoice; for first place in this competition each week can earn as much as $750! There's a separate leaderboard for HU Hypers, HU Regular+Turbo, 6-max Turbo, and 6m/9m Regular+Turbo. You get points every time you cash in one of these four categories of sit n' go. The following countries are NOT ALLOWED to create accounts with BetOnline or Sportsbetting: Australia, France, Panama, Ghana, Indonesia, Macedonia, Morocco, Nigeria, Montenegro. 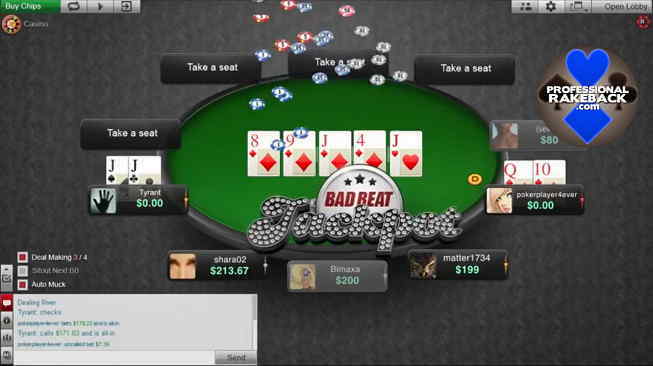 Betonline is an online poker site available to US poker players from all 50 states and US territories including the often excluded American states such as Washington, Missouri, New York, New Jersey, Delaware, Nevada, Kentucky, Maryland, and Louisiana. The Chico Network, on which Betonline and its sister site Sportsbetting.ag are housed, has a smaller, but juicier, tournament schedule when compared to other leading US-friendly poker networks. The tournaments on Chico Network and BetOnline are smaller-stakes in nature with larger fields and very soft competition due to the recreational nature of the network. It is worth noting that the tournaments on Chico Poker Network do not offer lengthy rebuy or reentry options like many other US-friendly networks. Thus, the tournaments here are short and sweet with many of the smaller-buyin tournaments lasting approximately 3 hours. Whenever a tournament has a rebuy format, that typically only lasts 1 hour, which helps you avoid playing poker into the early hours of the morning if you happen to "go deep" in an MTT. There are of course a wide variety of tournaments outside of what we are about to show you, but Professional Rakeback staff has put together a list of the multi-table tournaments that we find most interesting and most profitable. Each weekend, there is over $250,000 worth of guarantees in the BetOnline poker tournament schedule. This number is somewhat small when compared to some other networks, but it's not quite an apples-to-apples comparison as the Chico Network doesn't slap a guarantee on every tournament they offer like some networks do. Betonline uses the poker software developed by Connective Games. This is a marked upgrade over the old software solution developed by Playsafe Holding, which is currently used only by obscure and little-trafficked poker sites. The Connective Games poker client, on the other hand, is found not only across the Chico Poker Network but also several popular international online poker operations, like Pokerdom and Aconcagua. In April 2017, BetOnline made its poker room compatible with other platforms than just the PCs and Macs it catered to before. You see, BoL introduced an impressive mobile poker client. It works with both Android and iOS systems, and it has virtually the complete lineup of poker games that you can access from the desktop application. 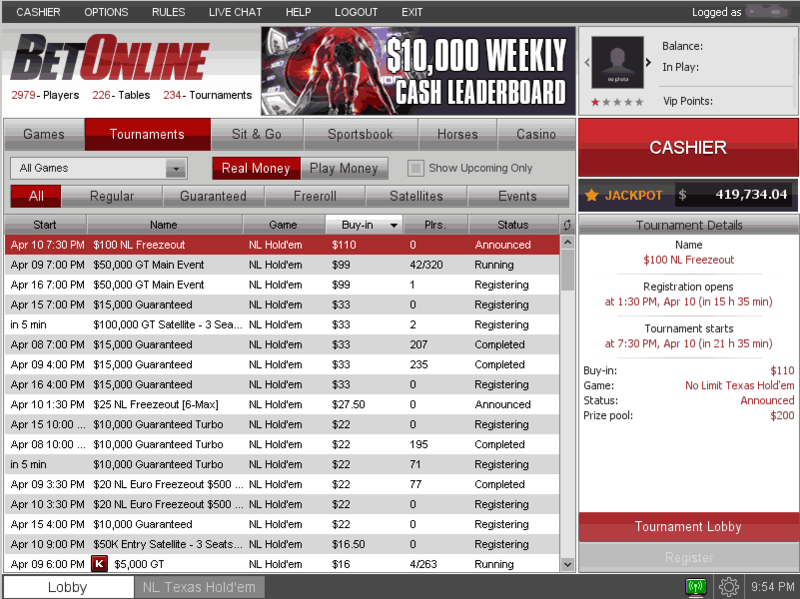 In addition, there's a web-based poker interface from which you can play with almost any web browser. PokerTracker 4 (external hand converter required): The well-rounded PokerTracker 4 program is beloved by fans who appreciate its wealth of reports and robust HUD-customization features. Although it's not natively compatible with BetOnline, there are third-party hand converters available that can read hand histories from BoL and change them into a format that PT4 can use. 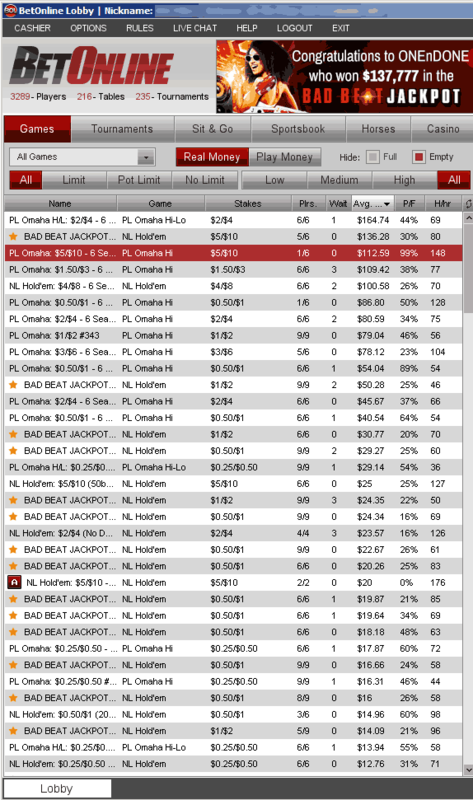 Check out our review of PokerTracker 4 for further details, including instructions on how to purchase it. Holdem Manager 2 (external hand converter required): Holdem Manager 2 has a very intuitive layout and permits you to filter and sort your results by any number of criteria. Needless to say, it also packs in a powerful HUD interface with plenty of user-changeable options. One downside is that it doesn't work on BetOnline out of the box; you need to acquire an additional hand converter to capture your hands in a form that HEM2 understands. We've prepared a Holdem Manager 2 review to answer all your questions and show you how to buy this enviable tracking software. Holdem Indicator (PC) and iHoldem Indicator (Mac): BetOnline provides a free odds calculator that's based upon the Holdem Indicator line of tracking software, but it's limited and, worst of all, only works on BetOnline/Sportsbetting.ag. If you wish to unlock the full potential functionality of this program, you ought to buy a full license. We've negotiated special pricing for both Holdem Indicator (Windows version) and iHoldem Indicator (Mac). Find out how to receive your discount in our poker software page. Besides the daily cash and weekly SNG leaderboards mentioned above in the rakeback section of this BetOnline Review, there are more promotions offered here. Every month there are static promotions like the ones we are about to mention below, as well as monthly promos, typically related to the season at hand, an upcoming holiday, et cetera. Lets take a look at the static monthly promos below. All Professional Rakeback players are eligible for one discounted cash out every 30 calendar days. This discount can only be claimed on Fridays. All payout methods are eligible and the maximum discount is $50 off (making virtually all payout methods free of charge). If you would like to participate in the Free Friday Payout promotion at BetOnline, then you will need to let support know and specifically specify that you would like your discounted / fee-free withdrawal on this particular payout request. Players who have not completed minimum bonus rollover requirements are not allowed to participate in this promotion. There's a perhaps easier way to avoid any withdrawal fees that you might otherwise be charged, and it works every day, not just once per month on a Friday. All payouts via crypto-currencies are free! Bitcoin, Litecoin, Ethereum, Dash, and Bitcoin Cash are your options. If you're not sure how to use these digital coins for online poker, then you can read our Bitcoin online gaming guide, our Ethereum internet gambling overview, and our Bitcoin Cash online poker page to find out how to get started. Before withdrawing with these crypto-currencies, you may be required to first make a deposit with them. This is poker; bad beats happen. At BetOnline, thanks to the Bad Beat Jackpot promotion, taking an exceptionally bad beat is a good thing. One person who “lost,” with a straight flush inferior to a higher straight flush, took home $229,350.34 in compensation! The BBJ program is strictly voluntary with BBJ tables clearly marked so that players can choose when they wish to participate in BBJ games. The BBJ has exceeded $950,000+ before. What happened to the micros? Permalink Submitted by cutre44 (not verified) on Thu, 12/06/2018 - 02:16. There used to be micro stakes games on this site. What the hell happened? Now I can't play penny games but have to pla y for 25 dollars buy-in minimum? Permalink Submitted by PRB Responds on Sat, 12/08/2018 - 12:50. Sorry to inform you cutre44, but the Chico Poker Network, of which BetOnline is the biggest operator, got rid of micro stakes Texas Holdem and Omaha games in late 2017. We never got a good reason from them for this. It does not make business sense to us really but we are sure they had some reason for it. Either way, there are plenty of other networks and sites to play on, just read any of our dozens of poker site reviews for more information! Permalink Submitted by shooookr (not verified) on Sun, 03/10/2019 - 06:06. Are the bad beat tables rigged? I play every day for over 2 years and never have won anything! Im bout to fkn leave this stupid site. Where else has bbj tables? Permalink Submitted by PRB Responds on Mon, 03/11/2019 - 10:12. Unforunately, bad beat jackpots have fallen out of favor in the online world. Very few exist any more. The largest ones by far, are on the Chico Poker Network, aka, where BetOnline is located. We recommend you stick it out with BetOnline or else you'll be playing for 4 figure bad beat jackpots rather than 6 and 7 figure pots! The EV is clearly at Chico Network. We also do not believe the BBJ at BetOnline is rigged. However, we do find fault with the way the money is distributed. We wrote an article about it that you might enjoy reading.